“Dear Friend:—I have taken upon myself the painful task to inform you of the death of your son, John H. Cross. 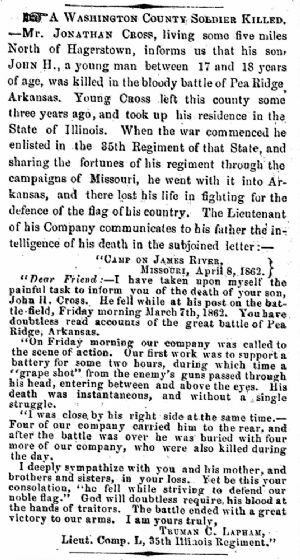 He fell while at his post on the battle-field, Friday morning March 7th, 1862. You have doubtless read accounts of the great battle of Pea Ridge; Arkansas. “On Friday morning our company was called to the scene of action. Our first work was to support a battery for some two hours, during which time a "grape shot” from the enemy’s guns passed through his head, entering between and above the eyes. His death was instantaneous, and without a single struggle. “I was close, by his right side at the same time.— Four of our company carried him to the rear, and after the battle was over he was buried with four more of our company, who were also killed during the day.